Q: Is China going to send a delegation to the Moscow Non-proliferation Conference later this week? A: Regarding this academic conference, as far as we know, Chinese experts and scholars are likely to attend it upon invitation. Q: It is reported that Japanese Prime Minister Shinzo Abe gave ritual offerings to the Yasukuni Shrine to mark the annual autumn festival today. What is China's comment on this? A: China's position on the issue of Yasukuni Shrine is consistent and clear-cut. We urge the Japanese side to faithfully face up to and show deep remorse over the history of aggression, properly handle relevant issues and take concrete actions to win the trust of its Asian neighbors and the international community. Q: According to media reports, President of the Philippines Rodrigo Duterte announced that Marawi has been liberated from the clutches of extremists. What is China's comment on this? 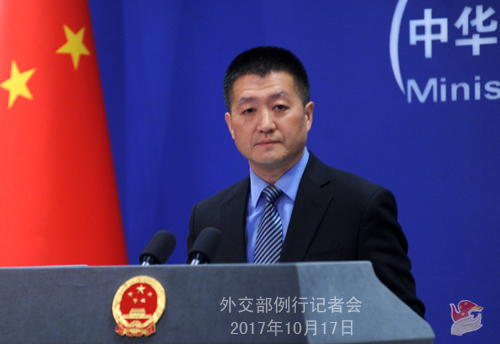 A: The Chinese side has taken note of the relevant report. Combating terrorism is the shared responsibility of all nations. The Chinese side sincerely hopes that the people in Marawi and the Mindanao region can enjoy the peaceful and tranquil life again at an early date. 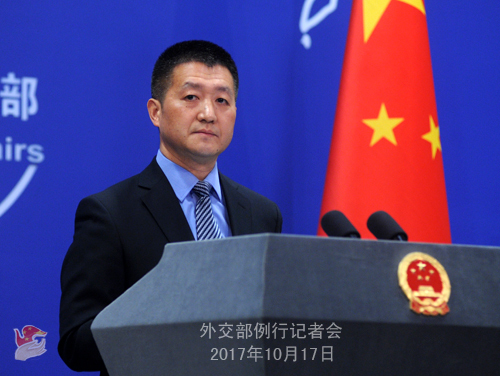 China stands ready to continue providing needed support and assistance in light of the needs of the government of the Philippines, including taking an active part in the post-war settlement and reconstruction of Marawi. Q: Yesterday, Federica Mogherini, the High Representative of the European Union (EU) for Foreign Affairs and Security Policy, said that the EU member states are unanimously in favor of the full and effective implementation of the Joint Comprehensive Plan of Action (JCPOA) in response to President Trump's speech last Friday. Does China have any comment on this? A: With regard to this question, relevant parties have made quite a few comments recently and we have elaborated on China's position many times. We always believe that the JCPOA is an important outcome of multilateralism and a model of peacefully resolving international hot-spot issue through political and diplomatic means on the part of the international community. It has played an important role in upholding the international non-proliferation regime and promoting the peace and stability of the Middle East region. We hope that all relevant parties can properly resolve their differences and jointly cherish and uphold the JCPOA. Q: Yesterday, a diplomat from the DPRK said at the UN General Assembly for Disarmament that a nuclear war may break out at any moment. Does China have any comment on that? A: In that case, it would by no means serve the interests of any party. Currently, the situation on the Korean Peninsula remains highly complex and sensitive. 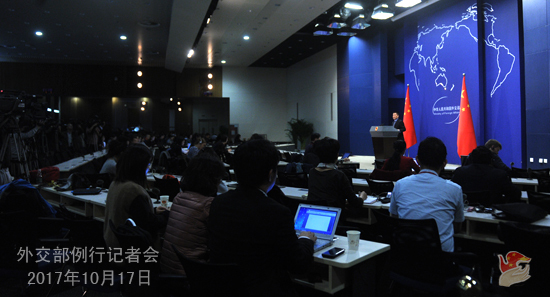 Against this backdrop, the Chinese side hopes that all relevant parties can exercise restraint and do more things that can help to ease the regional situation and make all relevant parties come back to the track of resolving the issue through negotiation instead of taking the steps which will provocate each other and add fuel to the fire.